Megaliths, stone circles, and cairns flank the 30 meter (100 foot) platform mound; its mortuary cavity contains an estimated several hundred individuals, tightly arranged. Most burials had highly personalized ornaments. Lothagam North demonstrates monumentality may arise among dispersed, mobile groups without strong hierarchy. An international team, including researchers at Stony Brook University and the Max Planck Institute for the Science of Human History, has found the earliest and largest monumental cemetery in eastern Africa. 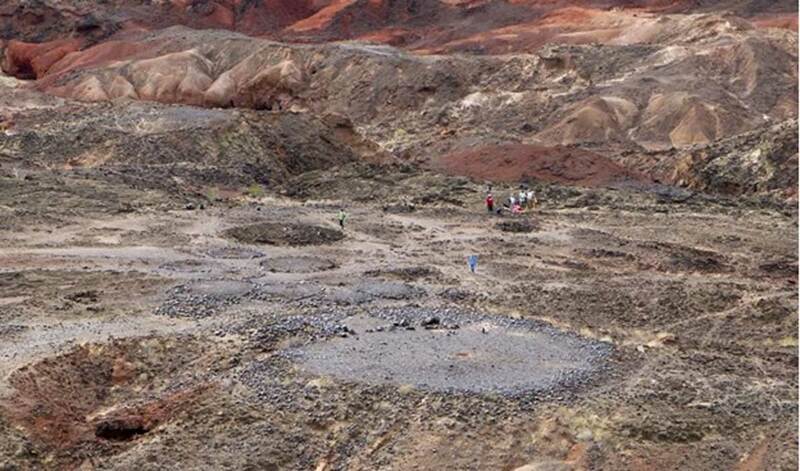 The Lothagam North Pillar Site was built 5,000 years ago by early pastoralists living around Lake Turkana, Kenya . This group is believed to have had an egalitarian society, without a stratified social hierarchy. Thus their construction of such a large public project contradicts long-standing narratives about early complex societies, which suggest that a stratified social structure is necessary to enable the construction of large public buildings or monuments. The study, led by Elisabeth Hildebrand, of Stony Brook University, is published in the Proceedings of the National Academy of Sciences . The Lothagam North Pillar Site was a communal cemetery constructed and used over a period of several centuries, between about 5,000 and 4,300 years ago. Early herders built a platform approximately 30 meters (100 feet) in diameter and excavated a large cavity in the center to bury their dead. After the cavity was filled and capped with stones, the builders placed large, megalith pillars, some sourced from as much as a kilometer away, on top. Stone circles and cairns were added nearby. An estimated minimum of 580 individuals were densely buried within the central platform cavity of the site. Men, women, and children of different ages, from infants to the elderly, were all buried in the same area, without any particular burials being singled out with special treatment. Additionally, essentially all individuals were buried with personal ornaments and the distribution of ornaments was approximately equal throughout the cemetery. These factors indicate a relatively egalitarian society without strong social stratification. Stone pendants and earrings from the communal cemetery of Lothagam North, Kenya, built by eastern Africa's earliest herders ~5000-4300 years ago. Credit: Image courtesy of Carla Klehm. An egalitarian society building monuments? Historically, archaeologists have theorized that people built permanent monuments as reminders of shared history, ideals and culture, when they had established a settled, socially stratified agriculture society with abundant resources and strong leadership. It was believed that a political structure and the resources for specialization were prerequisites to engaging in monument building. Ancient monuments have thus previously been regarded as reliable indicators of complex societies with differentiated social classes. However, the Lothagam North cemetery was constructed by mobile pastoralists who show no evidence of a rigid social hierarchy. "This discovery challenges earlier ideas about monumentality," explains Elizabeth Sawchuk of Stony Brook University and the Max Planck Institute for the Science of Human History. "Absent other evidence, Lothagam North provides an example of monumentality that is not demonstrably linked to the emergence of hierarchy, forcing us to consider other narratives of social change." The discovery is consistent with similar examples elsewhere in Africa and on other continents in which large, monumental structures have been built by groups thought to be egalitarian in their social organization. This research has the potential to reshape global perspectives on how - and why - large groups of people come together to form complex societies. In this case, it appears that Lothagam North was built during a period of profound change. Pastoralism had just been introduced to the Turkana Basin and newcomers arriving with sheep, goats, and cattle would have encountered diverse groups of fisher-hunter-gatherers already living around the lake. Additionally, newcomers and locals faced a difficult environmental situation, as annual rainfall decreased during this period and Lake Turkana shrunk by as much as fifty percent. Early herders may have constructed the cemetery as a place for people to come together to form and maintain social networks to cope with major economic and environmental change. "The monuments may have served as a place for people to congregate, renew social ties, and reinforce community identity," states Anneke Janzen also of the Max Planck Institute for the Science of Human History. "Information exchange and interaction through shared ritual may have helped mobile herders navigate a rapidly changing physical landscape." After several centuries, pastoralism became entrenched and lake levels stabilized. It was around this time that the cemetery ceased to be used. "The Lothagam North Pillar Site is the earliest known monumental site in eastern Africa, built by the region's first herders," states Hildebrand. "This finding makes us reconsider how we define social complexity, and the kinds of motives that lead groups of people to create public architecture." The article "Massive monumental cemetery built by Eastern Africa's earliest herders discovered in Kenya." was originally published on Science Daily.